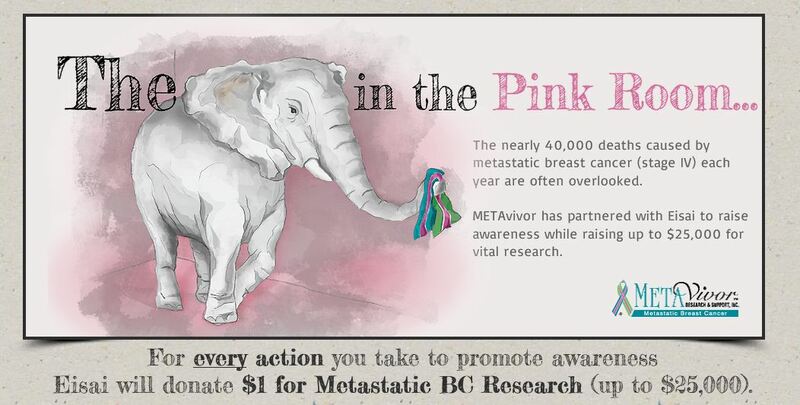 In 2012 METAvivor launched it’s “Elephant in the Pink Room” campaign to highlight that despite pervasive awareness of breast cancer thanks to both legitimate awareness campaigns and “Pinktober” marketing, what we still try to ignore is the reality of getting, living with and dying from metastatic breast cancer. This morning I discovered that the campaign was essentially stolen by Kohl’s Department Stores to “fundraise” for Susan G. Komen and I am truly outraged! (Find the Kohl’s Cares campaign here.) First and foremost, it is disgusting that Kohl’s would impinge on a small non-profit organization’s pre-existing campaign in such a blatant and unethical manner, and do so to sell more products (like their “pink elephant” necklace) and direct “charitable” dollars to another, behemoth of an organization. The “elephant in the room” metaphor is about the effort to NOT see what is patently obvious in our midst. I find it difficult to believe that women in America are ignoring breast cancer in any way, or that we need Kohl’s to get us talking about it. On the contrary, what is not being discussed is the very real threat of metastatic breast cancer – the kind that can’t be cured, the kind that kills – the kind that pink ribbon parties find to be a downer. Kohl’s marketing is therefore not only a stolen ad, but a senseless one. Susan G. Komen (which has recently dropped “for the Cure” from their name) has a history of suing “mom and pop” fundraising efforts to protect their “for the Cure” brand. How ironic they partner with Kohl’s to impinge on a comparatively small, grant-giving nonprofit in this manner. Perhaps most insulting of all is that Kohl’s would run ripshod over METAvivor in pursuit of more profits with yet another marketing campaign disguised as a “cause” fundraising. When will it end? 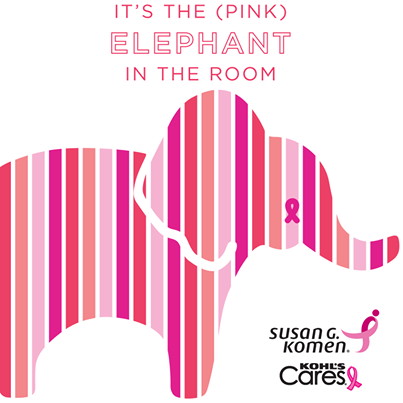 It occurs to me that there is one way to make this right: donate the proceeds to the originators of the “Elephant in the Pink Room” campaign – support METAvivor and make a real difference in the lives of those dying from breast cancer! 2/24: To read METAvivor’s open letter to Kohl’s click here. Thanks so much for joining this call. It is so utterly outrageous. Kohl’s wants to “start a conversation”, by hijacking a METAvivor’s campaign—adding insult to injury, to take us backward to empty awareness! We reached out to CJ yesterday to let her know. And I love seeing your voice there. Thanks for letting us know, Karuna! I woke up to an email from CJ and METAvivor is working on a statement now! Thanks, as always, for the keen eye and support of BCAction! I seem to be saying ‘crap’ here a lot lately. Stronger language leaps to mind on this, however. Is it possible that Komen could be even more out of touch with reality than they already are? Apparently so. What tiny corner of the so-called awareness world do they occupy, for goodness’ sake?? This just blows my mind. The METAvivor blog will having something posted soon, I assure you. Wow. It’s that kind of day! As for Komen, I’m not sure I’d call it a “tiny corner” and therein lies the problem…..
Zackly. A huge amount of noise that is beside the point. Oy. KOMEN helps so many stage IV breast cancer patients in this country and the stage of Minnesota. There are many non-profits that do not help the patient. Research monies are complicated. Some many non-profits raise money for research and for salaries. I support Susan G. Komen for the Cure because I have seen first hand how it impacts Stage IV and other breast cancer patients in this country. If you ask the patients they will Susan G. Komen helps them through other agencies. I am so glad you’ve found Komen to be helpful. While for the most part their priorities are not mine, I’ve been clear throughout my blog that we need Komen, though I wish they took the “for the cure” (which I believe they have officially dropped from their name) more seriously – mammograms won’t find a cure, research will. And I don’t personally believe that research monies are complicated. That said, in the Kohl’s-Komen partnership it is Komen that should have researched the breast cancer landscape before launching a campaign that bears numerous similarities to another organization’s efforts. No where else are people or organizations permitted to use the work of another without attribute or permission in order to make money for themselves, and “doing good work” is not a license to steal. If Komen knew about METAvivor’s “The Elephant in the Pink Room” and used it anyway it is shameful; if they didn’t it is negligent. And the irony that they are using a remarkably similar campaign to continue their disillusionary mammography agenda adds insult to injury. This is outrageous! It’s just not right to take the important message of the METavivor campaign and turn it onto a pink cause marketing thing. They have misunderstood the important elephant in the room message and this is extremely frustrating. Exactly! We are eagerly awaiting to hear back from Kohl’s, who promised a call from their president yesterday. Ridiculous that they are trying to stealing the ad of another group to sell pink clothing of all things! I shared this link on my facebook page and asked everyone to spend the money they normally would shopping at Kohl’s this week by donating that amount to metavivor to show our protest. Brilliant response – thanks Amy!! You are 100% right, Karen! I hope at least Kohl’s can see the error of their ways!